Lake Cerknica is unlike any other lake: here, the water comes and goes. Add the different seasons, weather and light, as well as the traditional use of the land by local landowners, and you have a place which will always surprise you! In summer, the lake-bed is usually dry and Lake Cerknica is appears to be just another part of the Cerknica valley. In the lowest parts of the valley, there are extensive reed beds and mud-flats. Everywhere there are the shells of aquatic snails. On the dry mud and in some places, you find countless skeletons of tiny fish, as a reminder of other seasons, when the lake held water. Late autumn is a rainy season in Slovenia, but the water which pours down from the clouds disappears into the ground. The water can seep down deeply because we are in a limestone area. Rainwater slowly dissolves the limestone rock. Deep down in the earth, you get an immense network of channels, underground streams and rivers and even huge caves. Eventually, the water reaches an even deeper, impermeable layer and here it is forced to flow horizontally. So, what you get is a landscape with little surface water, where streams and rivers flow underground. This, simply put, is called the Karst. In winter, water is bursting out of the Karst springs of Lake Cerknica! The Slovenian Karst is not flat, far from it: there are countless low mountains, depressions and valleys. The deepest valleys are so low that, in times of high underground water levels, they fill up with water. In this way, temporary lakes are formed. Lake Cerknica is the biggest of all with a surface of up to thirty square kilometers. In Autumn and spring, the Karst Lakes are usually full of water, winter is somewhat drier and summer can be very dry indeed. Plants, animals and human inhabitants have to adapt to the ever-changing water levels in order to survive. 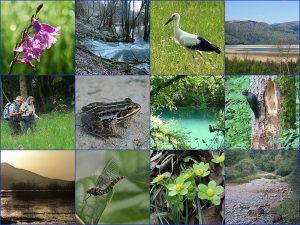 Together, they are part of the unique Karstic Wetlands. Because conditions change so much, it also differs what we can expect to see at Lake Cerknica. One day, you will encounter a large expanse of water, which is a paradise for waterbirds. The next time you visit the lake, you might find a frog hopping on land where terrestrial plants start to sprout in the drying mud. Depending on the conditions of the lake, we like to take you to the springs which fill the lake. Again depending on the conditions, these springs may well be dry. But regardless of the season and the conditions, many parts of the lake are quiet and we will see few tourists. If you really want to get to know the lake, you simply have to return over and over again! The setting sun reflects in the weather of Lake Cerknica, that is, when there actually is water: during much of the summer, the lake-bed is dry. Reedbeds and dense willow bushes dominate large parts of Lake Cerknica. Floristically most interesting are extensive hay-meadows, which have a diverse and flower-rich vegetation. In spring, Wild Gladioles, Summer Snowflakes and Marsh Orchids stand out. In summer Fen Ragwort and Yellow Water-lily flower. The carnivorous Flat-leaves Bladderwort is abundant, but it is easily overlooked because it grows underwater and it is very small. 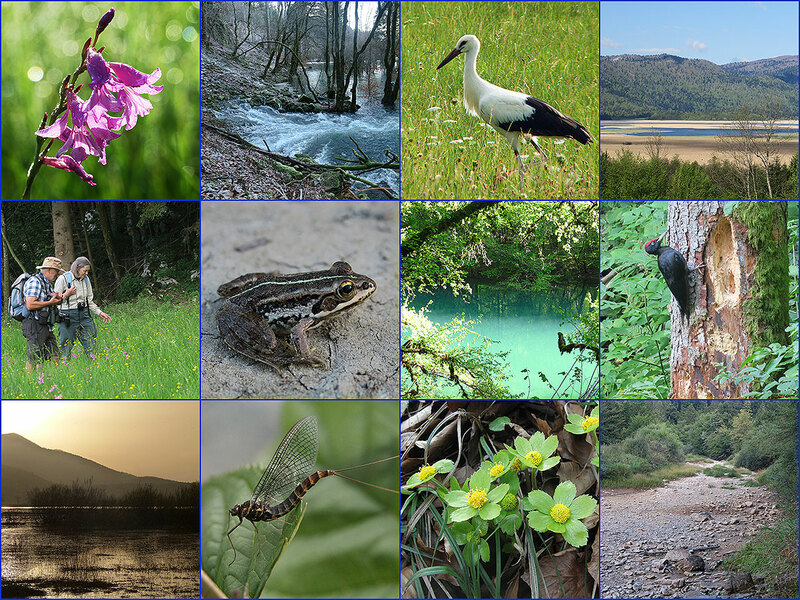 Lake Cerknica is a paradise for amphibians, which are well adapted to the ever-changing cycles of water and drought. Especially Pool Frog, Edible Frog and Common Toad are numerous, while the forest edges are home to the largest population of Grass frogs of Slovenia. Newts are comparatively rare and are mainly encountered in small pools along the edge of the lake, out of reach for predatory fish. In spite of the summer droughts, a number of fish species manage to survive in the lake. In the middle of the valley, there is a broad stream which holds some water throughout the year in which fish manage to survive, even though summer conditions are tough with high temperatures and low oxygen levels. The local fishermen’s society maintains an artificial dam, which retains water in a part of the lake. Each time when the lake bed dries, they organise an emergency action to save part of the fish. The most important fish species are Pike, Tench, Burbot and the endemic Barje Sculpin. You may well encounter Perch and Rudd: both are introduced in the last century and are now the most numerous fish in the lake. The Marsh-flora of Lake Cerknica is highly diverse, in some parts of the lake, Cottongrass stands out. With high numbers of amphibians and fish, it is no surprise that birds are attracted to the valley. Herons are common, especially Grey Heron, which can also be seen in fields, hunting for voles and earthworms. White Storks have colonised the Cerknica valley in recent decades and there are now several nests. Black storks are much shyer and are usually seen when they fly to foraging places. Both stork species are migratory and only at the lake in spring and summer. In spring, Red-footed Falcons stay for several weeks at the lake while in fall it is an important stopover for waders and ducks. In recent years, large flocks of Common Cranes are attracted to the lake in late fall. Of smaller birds, we have to especially mention Whinchat, Yellow Wagtail, Corncrake, Quail and Red-Backed Shrike, all of which are still finding good habitats in the valley. Mammals tend to be shy and nocturnal and are not easily seen. The most visible is Roe Deer, which grazes in the forest edge at dawn and dusk. Footprints at the water edge betray the presence of numerous other species including Brown Bear, Wolf, Lynx, Jackall, Red Deer, Wild Boar, Badger, Otter and Fox. Because it is such a diverse area, we visit Lake Cerknica at most of our tours. If you are especially interested in this area, you can also book our one-day trip called The Disappearing Lake, or join us at dusk to listen to Animals at Night. Lake Cerknica is an eldorado for waterbirds. Besides these Mute Swans, you may see other, more rare species including Red-necked Grebe and White-eyed Duck.